Do you have a dark and creepy basement, too much money and stupid friends?! Well then this is the chair for you! This chair doesn’t just look menacing, it actually will give you a bit of a shock. Which is the reason there are little straps for your legs. The site claims that there is little or no risk involved. However, those with pace makers and/or a brain might not want to push their luck on this one. I keep hoping that the whole thing is a simulation, but there is no way to actually confirm that on their site. I especially hope the part where they state “see the smoke rise as the voltage is increased” has at least fake smoke involved or they are exaggerating. Otherwise, I have lost all hope in the world. I would also like to point out that this chair somehow managed to land itself in their games section. Granted it may just be an oversized version of the remotes that produce a slight shock when you press the button. Either way though, the fact that this chair even exists creeps me out a bit. To get your own it will cost you about $1000 and even though I find this chair to be disturbing, please send in photos of it in use if you pick one up. It looks similar to the Addams Family ‘shocker’ arcade game that’s in many movie theaters… looking for it on youtube, i came across a video of some kids at an amusement park, which seemingly had an electric chair almost exactly the same as the one shown here. I honestly don’t think it actually shocks you.. the handles just vibrate like crazy, and makes your hands numb.. i’ve played the addams family game, and its actually pretty difficult to keep holding on. I did use one of these chairs before, it was in Vegas at the New York New York, it wasn’t a shock but the handles vibrate so much it shakes your hands and fells like it might be. You just need to press them forward hard and the needle keeps rising. It was fun from what I can remember! Vegas baby! Been there done that got the T shirt…….Oh and I also wrote the software for this baby! 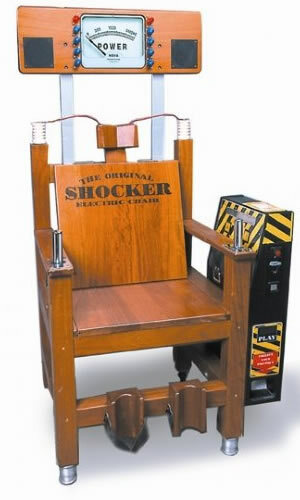 Ahh – The good old shocker chair. Going slightly science way, just like the Addams family generator, the Popeye strength tester, Tower of Terror, the Hot Seat, Star Trek Borg Contact (I could go on) it is very rapid vibrations getting more rapid every 5 seconds or so. There is no health warnings too. I am very interested in these.. my nearest Bowling alley have the Addams Family themed one, they said they make alot of money from it – profit is good from it then! Most Arcade/Amusements have some version of this, and they are pretty fun, if you do try it. they have one of these chairs at southend but the sound don’t work but the game does. i always do it on high power and i always win. my dad (who is a beach bum) tried it on low power but he failed. he is just crap at stuff like this. Where can I buy it? Can somebody help me?